How to remove DRM from iTunes movies, TV shows and music videos on Windows? It is commonly known that iTunes videos in M4V format come with DRM. So you are limited to watch iTunes TV shows, movies and music videos on Apple’s devices only, even though you purchase it. However, you may want to play your iTunes videos on non-Apple devices. To enjoy iTunes vidoes without DRM anywhere and anytime you wish, you should remove DRM from them. You need to convert them to your media player support video format. Almost all media players support MP4 format, so it is convenience for you to convert iTunes videos with DRM to MP4 format. In order to remove DRM from iTunes videos, you need a professional iTunes DRM remover - Ondesoft iTunes DRM Media Converter for Windows. It is able to remove DRM from iTunes TV shows, movies and music videos, then convert them to MP4 format. It is specialized in removing DRM from iTunes videos. This professional iTunes video DRM removal tool works at 30X speed and keeps the original video quality to output MP4 videos. It also allows user to customize output audio track and subtitle settings. 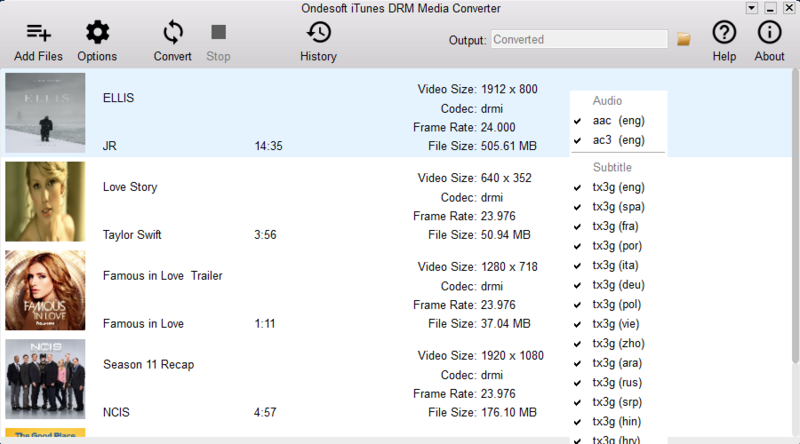 Now download Ondesoft iTunes DRM Media Converter for Windows and follow the guide to remove DRM from iTunes TV shows, movies and music videos. How to remove DRM protection from iTunes purchased or rented movies and TV shows? How to convert iTunes rented/purchased M4V movies and TV shows to MP4? It's easy! Here is a step-by-step tutorial for your reference. 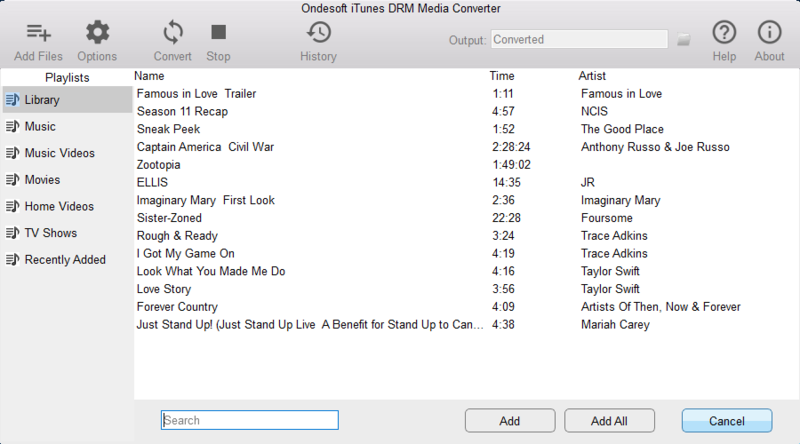 Launch Ondesoft iTunes DRM Media Converter and iTunes will be launched automatically. Select video files you want to import and click the Add button. Click the Add all button to import all DRM M4V videos. 3. Click to choose output audio tracks and subtitles. 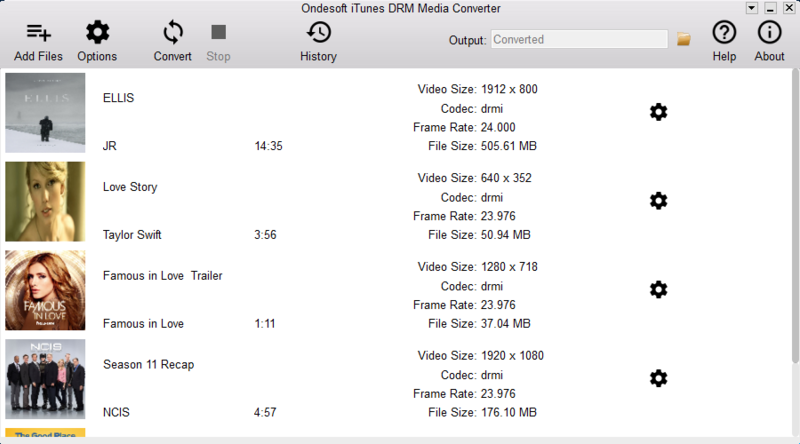 Ondesoft iTunes DRM Media Converter will preserve all original subtitles and audio tracks by default. Click the Gear button to uncheck the ones you don't want. Output M4P file will be saved to Documents - Ondesoft iTunes DRM Media Converter - Converted by default. You are free to select and preserve any one. After all the settings, click "Convert". Ondesoft DRM Media Converter begins to remove DRM from below m4v video files. When the conversion finished, you can play the output mp4 file with any video player or non-Apple devices, such as Android phones/tablets (HTC 10, Huawei P9, Huawei P10, Samsung Galaxy S8, Samsung Galaxy Tab S3, etc. ), Windows phones/tablets, streaming devices (Roku, Chromecast, Plex, Nexus Player, etc. ), TV&consoles (Xbox One, Xbox 360, PS3, PS4, Smart TV, etc. ), Windows Media Player, etc. Thanks for your sharing. I have confused about how to convert M4P files to an MP3 format. After searching a lot of information, I found a powerful third-party DRM audio converting tool, which can help you batch convert all DRM protected files like Apple Music, Audible audiobooks to MP3 losslessly. More importantly, it's very easy to operate for users. There is a simple tutorial to convert DRM-ed audio to MP3 for playback freely.